...or Sauvignon Blanc, or Riesling. Or Pinot Grigio, Gewurtztraminer, or Chenin Blanc for that matter. That was the theme of this month's Wine Blogging Wednesday(WBW) event hosted by Wine For Newbies. OK, so I went a little extreme here by restricting the first 6 to 10 most common white varietals I knew of, but where's the challenge in finding a Gewurtz? So the first thing I did was to research varietals that had a flavor profile that was similar to wine we already enjoyed. This meant finding something similar to a Chardonnay, Riesling or Gewurtz. Neither my wife or I really care for minerally whites, such as sauvignon blanc, so I also had to keep that in mind while reading the tasting notes of various wines. After a bit of research, I settled on two grape varietals of interest - the Albariño and the Scheurebe. Though I really wanted to try the Scheurebe, it just couldn't be found anywhere I looked, so I went with the backup and picked up two bottles of Albariño. Albariño is the predominent white wine of Spain, so locating a bottle didn't prove difficult at all. 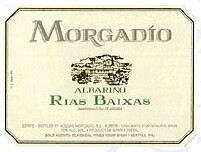 The two I ended up with are the 2004 Morgadío Albariño Rías Baixas($26) and the 2004 Pazo Serantellos Albariño Rías Baixas($8). This review will only cover the first one listed since we didn't open the second bottle. Almost pale yellow water like in color when held against a white backdrop. Bubbles in the Riesling glass! Very, very small bubbles up the side of the glass. None in the chardonnay glass. Smells of a typical white wine. Nothing really special or unexpected on the nose. But the taste...Zingy, Zesty, Effervescent!? Beautiful acidity. Nectarine? Plum maybe!? Honeysuckle. Lots of green apple when chilled. Just a gracefully small touch of butter. Taste started off like a sauvignon blanc/pinot grigio, but finished like a dry riesling, with a little chardonnay butteriness thrown in the middle for good measure! More green apple and other fruitiness apparent from the Riesling glass which is probably the proper glass for this wine. Short finish, but on the longer end of short. I wasn't disappointed at all by this wine. It was just a fascinating experience on my tongue because it's so unlike the whites that were restricted for this event. Actually, the odd thing is it tasted like all of the whites that were restricted for this event, just at different points of time from the initial attack through the finish. I won't go as far as calling it a complex wine, but it is certainly playful. The only downside I might see to this wine might be the price. If I was going to range my score, I would give it an 88-90. For that range, I'd like to see a price a little closer to $20, even if it's only $22. We'll see how the $8 bottle holds up and reserve judgment on the price until then.